Ringo Starr: I Became a Vegetarian after Watching a Bullfight in Spain . Beatles Radio: The Beatles, Solos, Covers, Birthdays, News The Fab 4 and More! 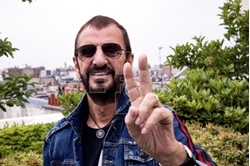 Ringo Starr reminisced about his first visit to Spain in 1965 with The Beatles, which he described as the best band on the planet, just hours ahead of a new European tour that kicks off on Wednesday in Paris, France and during which he is set to return to the Iberian country after more than half a century. In an exclusive interview with EFE, Sir Richard Starkey (Liverpool, 1940), better known by his nickname referencing his lifelong penchant for wearing several rings, said he was excited to go back to Spain, since his memories of the first time _ when Spain was still under the brutal military dictatorship of Gen. Francisco Franco _ were not the sharpest. "I'm afraid I was a young lad in those days and we were on tour, so it was busy," Starr said. "Didn't we go to a bullfight?" "I became a vegetarian that day," he added with a chuckle.